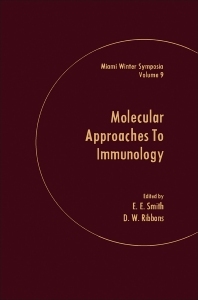 Molecular Approaches to Immunology is the 9th volume of the series ""Miami Winter Symposia"". This volume presents papers that cover various aspects about cellular and modern immunology. Cellular immunology deals with the interactions of cells and molecules of the immune system and how these interactions help eliminate pathogens. The main goal of this book is to discuss and provide basic assumptions, approaches, and direction about the advances in the research of immunological science. In relation to this, the chapters of the book examine the recognition of antigen by T-lymphocytes, the role of cell interactions in determining the immune responsiveness, and the concepts behind clonal selection. The book also explains the different genes coding used for antibodies and the characterization of cell surface receptors at molecular level. Furthermore, it examines the evidences for genetic restrictions in cell interactions and the chemical properties of thymosin used in physiological studies. Discussions on the immunoregulation and immunological tolerance by T cells and the growth control of mammalian cells are also presented in this volume. This compilation will be invaluable to biologists, medical practitioners, professors, and students. Can Protein Synthesis in Cultured Cells Be Regulated by Membrane- Mediated Events?